A couple of months ago, I decided to jump on the '1 Like = 1 Book' trend that was doing the rounds on Twitter. Basically, for each 'like' I got on my tweet, I would give a book recommendation... and, um, I got over a hundred. So, if you were lucky enough to miss me blessing spamming your timeline with amazing books, don't you worry because I've put the whole list here. 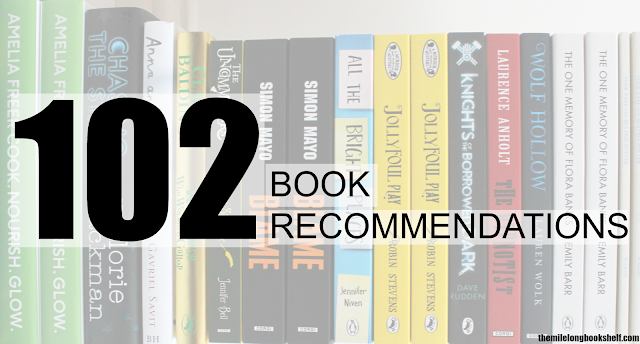 In the end, I tweeted 102 book recommendations! It's pretty varied with books of all genres and for all ages, so there should be something for everyone. 1. Anna and the Swallow Man by @GavrielSavit. Haven't finished it yet but it's one of the most beautifully written books I've ever read. 2. Beautiful Broken Things by @saramegan, a celebration of friendship and its importance especially when things take a turn for the worse. 3. Only Ever Yours by @oneilllo. So important and really opened my eyes to things I'd previously accepted without question. 4. #GIRLBOSS by @sophiaamoruso. Non-fiction and incredibly inspiring and motivational. One of those books I wish everyone would read. 5. Night School by @CJ_Daugherty. SO FUN. For one week all I did was read these books and I have no regrets. Fast paced and full of action. 6. One by @SarahCrossan. Heartbreaking but introduced me to a new form of literature I came to love. Seriously stunning. 8. Rebel of the Sands by @AlwynFJH. Mythology, adventure, gunpowder and a lot of action. Truly special and one of a kind. 9. Am I Normal Yet by @holly_bourneYA is the best representation of mental illness I've ever seen. Amazingly written + up for @yabookprize! 10. Maresi by @turtschaninoff is a Finnish, feminist fantasy story set on a women-only island. Fantastically original and very important. 12. Dani's Diary by @narinderd was one of the first YA books I read and I read it many times. Still remember my shock at that plot twist. 15. Finding Audrey by @KinsellaSophie does anxiety so well and would give anyone without it a really good understanding of the illness. 17. Hello, I Love You by Katie M Stout is a romance set in a Korean boarding school. Loved the culture in this so much. 18. Chasers of the Light by @TylerKnott is a beautifully presented book of poems and photography. I wish I could write like he does. 20. The Next Together by @Lauren_E_James: clever, funny and unpredictable time travel. Can't wait for the next book! 22. Love Song by @sophiabennett is the atmosphere that comes with @Adele's music trapped between the pages of a book. Loved it. 23. Reasons to Stay Alive by @matthaig1 is hope in a book. Really the only way I can think to describe it. 24. An Inspector Calls by J.B. Priestley. Had to study it for GCSE but actually really enjoyed it. Didn't expect to! I like the film, too. 25. Humans of New York: Stories by Brandon Stanton. Photos and stories from strangers in NYC. So fascinating and full of wisdom. 26. Alex As Well by @alyssabrugman, the story of an intersex/trans teen. Interesting, insightful, unique and taught me a lot. 27. Charm and Strange by @stephkuehn. So powerful it left me speechless. 32. Split by a Kiss by @LuisaPlaja. Jo moves to the US where things are more different than she ever imagined. One of my first review books! 33. The Square Root of Summer by @hapgoodness. Not your average YA! Wormholes, spacetime, beaches and parties all so cleverly intertwined. 34. We Are Giants by @AmberLeeDodd. Sydney doesn't want to grow up because she'll become taller than her mum who has dwarfism. A sweet MG! 35. Boys Don't Cry by @malorieblackman. Dante has a bright future ahead until his ex-girlfriend turns up with his baby. Brilliantly twisty. 37. The Poisoned House by Michael Ford. An unpredictable horror set in the 1800s in a house with a dark secret. Gripping + full of intrigue. 38. Did I Mention I Love You? by @EstelleMaskame. A well written romance that pushes the boundaries of YA. Perfect start to the trilogy. 42. This is Not a Love Story by @Kerensd who writes some of the best YA out there. Beautiful writing and brimming with culture. 43. Anthem for Jackson Dawes by Celia Bryce is like The Fault in Our Stars for younger readers. 44. Code Name Verity by @EWein2412 is set in WW2 and is from the POV of two incredible women: a pilot and a special agent. So amazing. 45. Pretty Girl Thirteen by @LizColeyBooks. A poignant and sinister psychological thriller. Recommended it SO many times. 46. #GirlsCanVlog by @truffleoilyum. Warm, funny and perfect for aspiring vloggers. 47. Gimme a Call by @SarahMlynowski. Devi's phone only calls one number... hers, at age fourteen, three years ago. Love Mlynowski's writing! 48. Dangerous Girls by Abigail Haas, a 'whodunnit' book with an interesting and complex plot. More law and court cases in YA please! 49. Amber by Julie Sykes, one of those books where even the tiniest + unimportant things end up being significant. Underrated but brilliant. 50. Ketchup Clouds by @APitcherAuthor. Zoe's story unfolds in letters she sends to a murderer on death row. Raw, realistic + heartbreaking. 51. From What I Remember by @stacy_kramer. Kylie wakes up in Mexico w/hangover + hottest boy in school - and they're wearing wedding rings..
52. Boys Don't Knit by @TomEaston is hilarious, witty and doesn't conform to gender stereotypes. 54. Lady Midnight by @cassieclare, her latest book and my favourite of them all. My heart hurts just thinking about it. 55. The Academy: Game On by Monica Seles. Tennis, rivalry, and discovering who you are. This book almost made me like sports. Almost. 56. The Originals by Cat Patrick. 3 identical sisters, but they're clones, not triplets. And they exist as one person in the outside world. 57. The Year of the Great Seventh by @TeresaOrts1. Egyptian prophecies force Sophie and Nate on a NY adventure in a race against time. 59. How I Live Now by Meg Rosoff. I didn't think I'd like it but it took me by surprise. Good film, too. 61. Zelah Green by @VanessaCurtis1 does OCD and other mental health issues really well, I think. Warm, funny and entertaining, too. 63. A Boy Called Hope by @LaraWilliamson. Warm characters and beautifully written with a sprinkling of humour. It's a must read! 64. Can't Look Away by @donnacooner. A girl deals with a mountain of hate comments on her YouTube channel following her sister's death. 67. The Baby by @LisaDrakeford, a YA that focuses on parenthood rather than the pregnancy. Diverse + covers a wide range of topics. 68. Blue by @TheSeaSection. Surfing, romance and set in my favourite place in the world. 69. Storm and Stone by Joss Stirling. Brilliant, well rounded characters and great for fans of Night School. 71. The Secret Fire by C.J Daugherty and Carina Rozenfeld. Sacha will die on his 18th unless Taylor, across the channel, helps him. But how? 72. The World of PostSecret by Frank Warren. A non-fiction book of beautifully presented anonymous secrets. 73. The Accidental Life of Jessie Jefferson by Paige Toon. Jessie is reunited with her real father... who happens to be a famous rock star. 75. Far From You by @sharpegirl. Can Sophie find the person who killed her best friend before they find her? Unsettling and bittersweet. 78. How Hard Can Love Be? by Holly Bourne, set in a summer camp in California. Funny, feminist and a celebration of friendship. 79. Amy & Matthew by @CammieMcGovern. Amy helps Matthew with his OCD, and he helps Amy with her Cerebral Palsy. For fans of Eleanor & Park. 80. The Boy Next Door by Katie Van Ark, a cheesy but very cute story about a pair of figure skaters. 81. The Yellow Wallpaper by Charlotte Perkins Gilman. Interesting ideas on paternalistic culture, repression of individuality, and feminism. 82. The Wrong Side of Right by Jenn Marie Thorne. When your father is running for President but you don't like his policies, what do you do? 83. Unbecoming by Jenny Downham. A multi-generational YA with themes of abandonment, sexuality, and Alzheimer's. 85. Matched by Ally Condie. In the Society, officials decide who you love and when you die. But do they know best? Such an exciting trilogy. 86. Popular by Maya Van Wagenen. It's a memoir and follows the teen's experiment as she uses a 1950s popularity guide in the modern day. 87. She Is Not Invisible by Marcus Sedgwick. Laureth and her brother fly to NYC to unravel a dangerous mystery - but Laureth is blind. 89. Binge by @tyleroakley, a collection of essays that are absolutely hilarious. He has the best anecdotes, he really does. 90. The Sky is Everywhere by Jandy Nelson, a book that is genuinely impossible to sum up in 140 characters. So so so wonderfully written. 91. The Last Summer of Us by Maggie Harcourt, a summer road trip book that is the bittersweet tale of endings and new beginnings. 93. Roller Girls by Megan Sparks, a fun and lighthearted series about roller derby. 94. The Dolls by Kiki Sullivan. Boys want them. Girls want to be them. Someone wants them dead. A fast paced YA thriller with a difference. 96. The Folk of the Faraway Tree by Enid Blyton was one of my favourite books as a child. Insanely imaginative. Couldn't get enough of it. 98. The Diary of a Young Girl by Anne Frank. Read this numerous times over the years. It couldn't not go on this list. 100. The Year of the Rat by Clare Furniss is the heartbreaking story of 15yo Pearl whose mum dies after giving birth to Pearl's baby sister. 101. Model Under Cover: A Crime of Fashion by Carina Axelsson. Axelle needs to solve the mystery at the heart of Paris Fashion Week. 102. We Were Liars by E. Lockhart is poetic genius in book form. There are lots more I could have added (Matilda, Divergent and When We Collided to name a few) but I had to stop at some point and it was rather time consuming. Fun, though! Have you read any of the books on my list? What would you add?